Well, we started out our trip to Puerto Rico in true Webster fashion---late and missing the plane. I was so frustrated that no one would even TRY and help us get on. 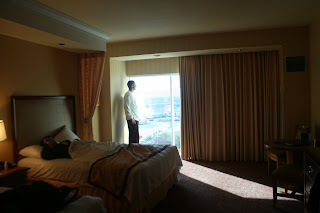 Everyone just kept saying, “you won’t make it.” Regardless, we ended up staying the day in Vegas. 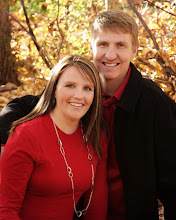 The Christensen’s, Eric & Joni, were with us, so I felt really bad about making them late. We went to lunch at the Cheesecake Factory, then got a room at South Point and had a nap. I rested for an hour or so, but mostly spent my time doing my power point presentation. It really turned out to be a blessing because I may not have gotten it done while here, and I am presenting on the 20th, so there was that good that came of it. We arrived in Puerto Rico on Friday evening. Changed clothes, had dinner and walked around the resort and visited with Eric & Joni. 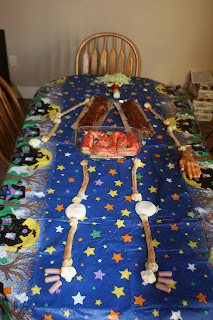 I had our Halloween dinner on Sunday following Halloween. Too much craziness to do it before. I decided to do a body again, just for fun. Mostly because I found some other cool body part recipes that I thought would be fun to try. I have been doing "orange" dinners for the last few years, so thought it would be good to surprise the kids with something a little more fun. Besides, Misi & Tiffany hadn't yet experienced one of our weird dinners yet. 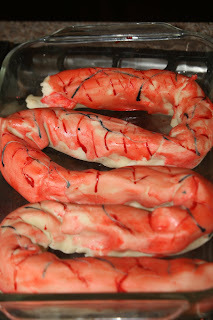 I decided to do real BBQ ribs for the ribs and found a cool recipe for intestines that I tweaked to our liking. I did a little twist to the breadstick bones, but my favorite part was the heart. 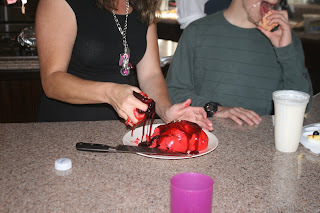 I found this cool recipe for a jello heart will real "blood" to ooze out from it. 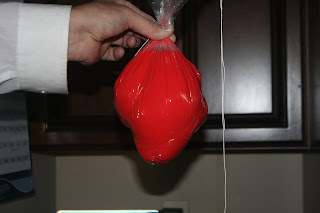 I couldn't find a heart mold, so I got creative and made one out of bread bag. It turned out really cool and realistic. The only downfall was that I made the "blood" a little thick so it didn't ooze properly when stabbed with a knife, so I had to grab it and squeeze it all over the heart. Which brought on the second problem-- it made Tiffany sick. I gave her the disclaimer in the beginning that she didn't have to eat anything that bothered her, since I've been in her spot before. She was doing good until the blood ooze thing. I felt bad. The good news is that she will be able to enjoy other Halloween and April Fool's dinners when she's not pregnant and miserable. It's hard to phase Misi. Between Samoa and the Phillippinnes, he's already eaten all of the weirdest real stuff anyway. Turned out to be a fun meal. Kameron's favorite part was the Orange drink. Funny! 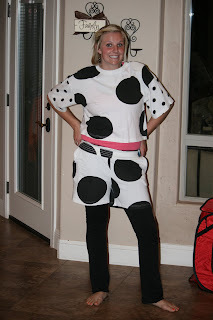 Why is it that you have to have 2-3 costumes per kid just to get through Halloween? It started off on Monday with Kam having a birthday party that he had to dress up for. We didn’t have costumes figured out yet, so the girls dressed him up as a hippie with my tie-dye shirt and the Jamaican Dred lock hat and some cool sunglasses. Come Thursday, Kallan had a dance at the school. 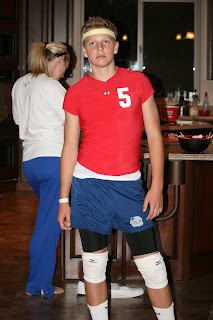 He dressed up like a volleyball player. The girls did a good job of making him look sweet! Friday came and Kallan’s “real” costume was to be “Hot Rod.” Mykelle and I stayed up till midnight getting that bugger ready. 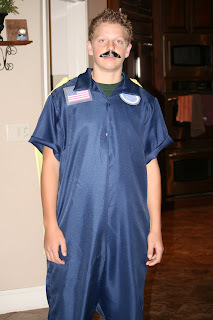 Because Kameron could never decide on a costume, we bought him the “Wheaties box” from Walmart, so he went to the Halloween parade as that. Britton was sick, so he had to miss school and was bummed. Saturday (after two football games) came costume time again. Whitnee and Mykelle had landed some good stuff at the DI. Misi dressed as a college football coach (go figure). 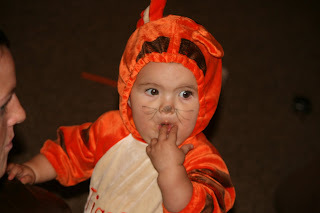 Palo looked so cute as Tigger. 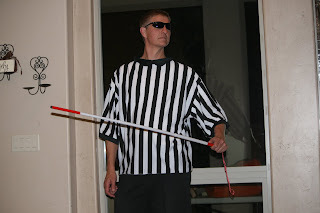 Paul dressed as a blind ref. 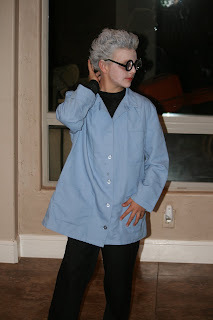 Britton went as a mad scientist. 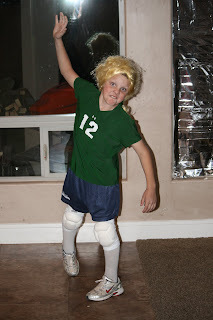 Kameron went as the volleyball player. Jadon dressed as a beat up nerd. I went as a hospital patient with a “breezy” hospital gown on. Paul was worried that I’d offend someone, but the first warders just thought it was hysterical. After all the Halloween fun—the party was not as busy as last year—we came home. 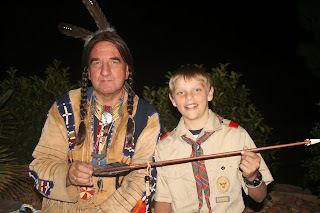 Britton received his Arrow of Light Award on a nice chilly night for Pack Meeting. 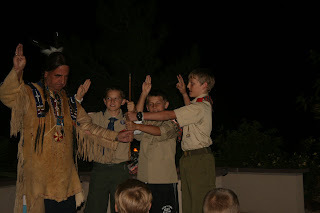 It was a really neat night with George Mackley who was dressed and talked to them about what it means and to challenge them to go on to earn their Eagle in Scouting. We were pretty proud of him! Nice job Britt! Britton is a great football player. 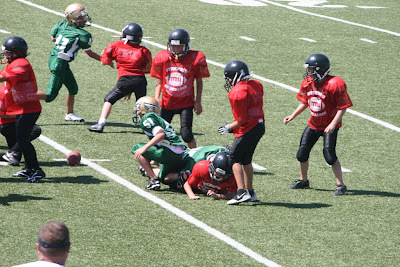 He is finally loving the sport and you can see why from this sack! He gets at least one a game if not more. He plays right guard on offense and is a linebacker on defense. 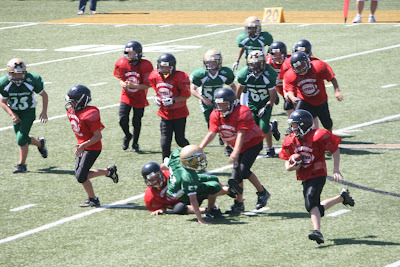 His highlight was an interception and a nice run back where he almost scored a touchdown. He has been so fun to watch! Nice job, Britt! 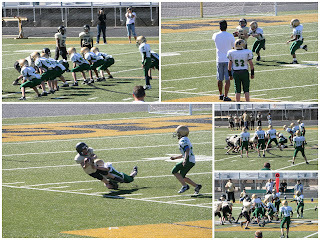 Kameron is loving football and he is a great player. He is the center and does a really good job. On defense, he is a defensive end. He loves it when he gets a sack!! 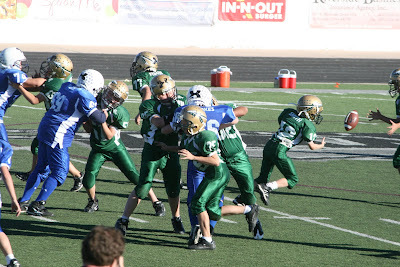 Here he caused a fumble and I believe he recovered it! He probably has the most disciplined team out there. They are good and fun to watch!! 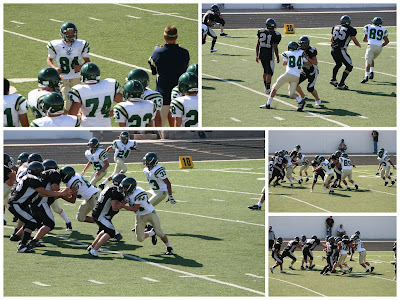 We've had so much fun watching Kallan play football this year. 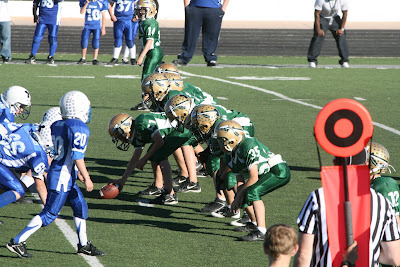 He is playing Defensive End and is doing a GREAT job!! He's #84. He's been working hard and has such a great love for the game and his team. It's been a great year! While eating dinner at Swiss Days, this mysterious package showed up on the table with a tag to "The Webster's." Inside was a bunch of envelopes with everyone's name on it and instructions to not open it until everyone was together. We were excited and wanting to see what it was. Kallan had left and we didn't know when he would be back. Misi was on his way, so we decided to open it up. We all had a puzzle piece and when we put them all together, it was a note telling us that Wes & Tiff were having a baby!! We were SO excited. So we get to welcome a sweet little spirit into our family in April! It doesn't get better than that! 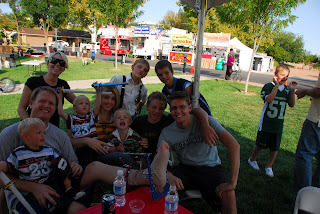 Swiss Days was a blast this year! 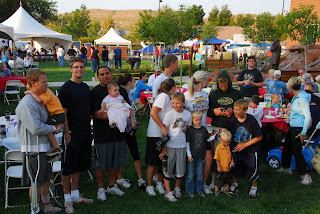 We decided to run the 5K as a family. So some of us were "training" to do it, others just ran for the fun of it. We started off Swiss Days on Friday afternoon. The kids went to the "hands on" for a little bit. 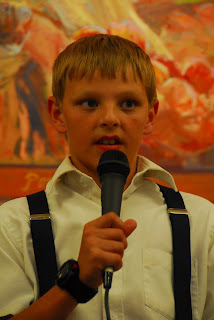 Jadon sang for an hour. Britton told the John Stucki story up around the mural, then we had dinner. We received a BIG surprise at dinner. 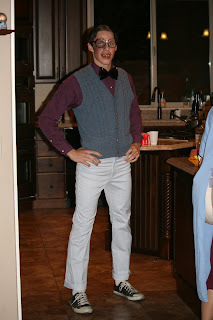 I'll post about it next...so keep reading.....following dinner, we went to the SCHS Homecoming football game. Saturday was a fun/busy day. We started out with the 5K. Kallan ended up coming in first in the family. I was last, but planned to be. I ran/walked/visited and really enjoyed myself. Jadon and Britton were the only two who didn't run. 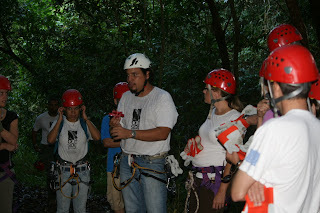 We had a good time and decided we all needed to improve our times for next year. Paul's goal is to beat Lainee's time. He is so funny. 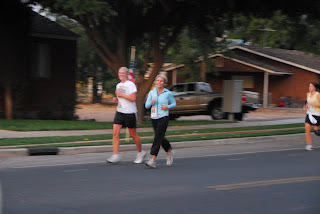 Following the 5K, we raced home and got ready for the parade. 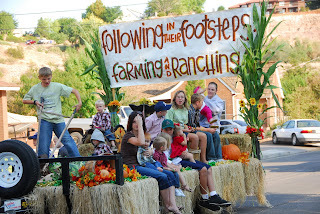 Mom, Lainee, Whitnee, Mykelle, Dennis & Bryce/Kalyn all helped on the float this year. It turned out really cute and we won a trophy. 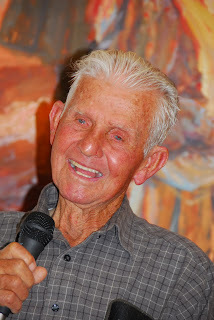 Following the parade, we listened to Grandpa talk about the history of Santa Clara. Then Paul headed to Cedar to Kameron's football game. 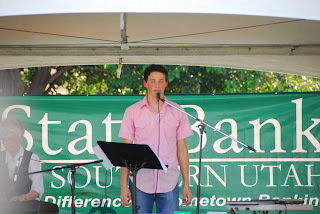 I went with Jadon to sing another song or two at Swiss Days, then I headed to Pine View for Britton's football game. Long days, but a fun weekend. We love Swiss Days around here! Especially since the cousins (Sue's kids) are always here!! Such fun!